Swordfish gives a dense steak cut and a solid texture. 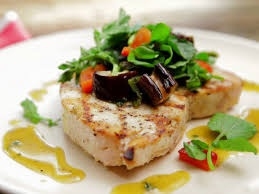 Swordfish is the preferred canvas for bold flavors because of its moderate and firm flesh flavor. It contains high amounts of mercury and hence should be consumed in moderation. Do not eat swordfish while pregnant. A well-cooked swordfish provides a dense and flaky sauce. Here are a few recipes of how to cook swordfish. Note: The recipe will take one hour and ten minutes to prepare. It takes 15 minutes to cook and makes 2 servings. Mix all marinade ingredients in a small bowl. Use cold water to rinse swordfish steaks and then pat dry. Keep the fish skin so that the steaks hold together when grilling. Put the steaks in a non-reactive dish and use marinade to coat all sides. Cover the mixture and refrigerate for 30 minutes to one hour. Heat the grill to high heat and use paper towels with olive oil to wipe its grates. This ensures that steaks do not stick on the grate when overturn them. 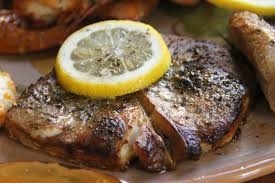 Remove any excess marinade from the swordfish steaks before placing them on the hot grill. Grill each side for 5-7 minutes and then turn over. Grill until the fish is well-cooked, remove it and allow it to rest for a few minutes before serving. 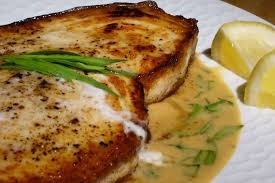 Do you know how to cook swordfish with butter sauce? Here is the full recipe. Note: The recipes will take 25 minutes to prepare and cook. It makes 4 servings. Heat the oven to 400°F. Mash ½ teaspoon ground mixed peppercorns, butter, lemon peel, garlic and parsley in small bowl. Season with salt. Add oil to large ovenproof skillet and heat over medium-high heat. Coat the swordfish with ground mixed peppercorns and salt and then place it in the skillet. Cook for about 3 minutes or until browned. Turn it over and then transfer it to the preheated oven. Roast for 10 minutes or more until the swordfish is just cooked through. Transfer the fish to plates. Add seasoned butter to the skillet used before and cook it over medium to high heat. Scrap all browned bits until all the butter is melting and bubbling. Pour the butter sauce on the swordfish and then serve. Note: You need 10 minutes to prepare the meal and 8 minutes to cook. The recipe makes 6 servings. Coat the swordfish steaks with paprika, pepper and salt. Preheat a greased broiler rack, place the steaks on the rack, and then brush with melted butter. Put the steaks under the broiler, about 2-3 inches from the source of heat . You can also use an oiled grill grate or greased fish grilling basket instead of the greased broiler rack. Broil for about 4 minutes before turning them over. Brush the steaks with more butter and broil for another 4-5 minutes. The steaks are flaky and lightly browned when ready. 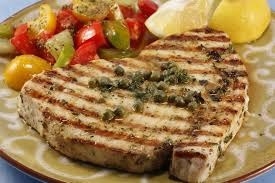 Transfer the swordfish steaks to plates or a platter and sprinkle with fresh parsley if needed. Serve with lemon wedges, potatoes and rice. Note: The recipe takes a total of 15 hours and 35 minutes for preparation and cooking. It makes 6 servings. Add sugar, peppercorns, and salt to 8 cups of water in a deep pot and stir thoroughly. Boil the mixture to dissolve sugar and salt and then cool completely. Submerge the swordfish in the cooled brine and then refrigerate for 12 hours. Rinse the swordfish with cold water, pat dry and leave it to dry for an hour. Ensure the exterior of the fish feels sticky before smoking. Use Maplewood chips to heat a smoker to 200-225°F. Brush the canola oil lightly on the fish and then sprinkle pepper and salt. Smoke the fish 2 hours as you add chips where needed. Add more chips in the second hours for a smokier flavor. Transfer the fish to a platter when ready. Remove the meat from clams and chop it roughly. Add canola oil to a medium saucepan and heat it over high heat. Add chile and garlic, cook for a few seconds and then add the chopped clams. Cook and stir for a minute. Add wine to the sauce, simmer, and cook until the sauce is reduced by half. Put the whole clams in the sauce and cook the mixture with the saucepan covered. Allow it to cook for 5-10 minute until clams open and keep shaking the pan frequently. Add the butter and stir. Remove the sauce from the heat and add lemon zest and chopped parsley. Add salt and pepper for seasoning and taste. Pour the sauce all round and over the smoked swordfish. Garnish with the parsley leaves and serve.